Portable and powerful, with an excellent loudspeaker. Pricey compared to other Katanas. 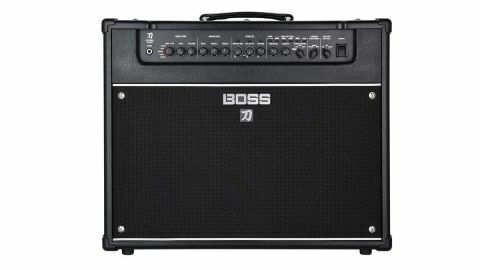 Boss’s first amplification range arrived with a flourish last year and has been enjoying great press and popularity ever since, combining next-gen amp modelling with Boss-approved effects at competitive prices. Headed up by the mighty Waza Craft heads, the Katana range has recently benefitted from a firmware update with several new features, while the hardware has been expanded with two new small combos including a fully wireless model, and this amp: the range- topping Katana Artist 1x12 100 watt combo, which promises more Waza DNA, including a Waza Craft G12W loudspeaker. The Artist is visually different from the other Katana amps, with a front-facing letterbox control panel, although the controls are quite similar. The cabinet uses a ply baffle joined to MDF side panels - it’s solid enough although this is the most expensive Katana combo by quite a margin. As Boss appears to be offering a more boutique vibe here it’s slightly disappointing it didn’t use solid pine or poplar ply, which would have enhanced acoustic resonance without adding much to the build budget. The Artist’s electronics sit in a robust open-ended steel tray chassis which encloses a substantial mains transformer and a massive heat sink for the output devices. There are two main boards: one mounted vertically behind the front panel controls and the other sat in the middle of the chassis on metal standoffs. There’s nothing to tinker with on this PCB; most of the electronics are sub miniature surface-mount, with several ICs including the main Roland-branded sound engine. This is an indication of the kind of leverage Boss has - not every amp company can afford to produce its own microprocessors. There are several neatly-tied bundles of wire terminated in multi-pin connectors that hook everything together, giving an overall impression of solid reliability. It’s an impression that carries over to the control panel, with simple white lettering on a textured black background and plain black control knobs. The Artist mostly follows the same layout as other Katanas with an amp select knob offering a choice of five different voice settings: Acoustic, Clean, Crunch, Lead and Brown, derived from the Waza Craft head’s Brown channel. There are comfortingly familiar controls for gain, volume, bass, mid and treble, with a master volume, presence control and an output level switch that offers 100, 50 and 0.5 watt output options, plus a standby/mute setting that uncouples the speaker but leaves the line out and USB audio active. The effects section follows the same pattern as other Katanas with two split rotary level controls - one for boost and mod effects, the other for Delay and FX - and a third un-split level control dedicated to reverb. Above each level knob is a small button switch that accesses three pre-loaded choices for each effect position, colour-coded by an LED that lights up in red, green or yellow. There’s also a tiny illuminated tap-tempo switch for manual delay time setting. So on the amp itself you have direct control over effects levels, which is really all you need, but tweakers need not worry as the Katana’s software app provides more than enough gratification with, typically, six parameters to play with on most effects. Pre-set counters will have already worked out the Katana Artist can hold 15 different effects including reverbs; you can choose from no less than 58 different models in the latest Version 2 software and load them into the amp, which can use up to three simultaneously. There are four patch select buttons with an A/B bank select switch, which access the Artist’s eight on-board memory slots when the foot controller isn’t in use. This Tone Studio app has many other functions that considerably enhance the Katana’s flexibility. For example, the simple effects loop jacks on the rear of the amp have fully variable send and return levels, can be configured for series or parallel operation and the loop can be inserted post amp or post reverb, with loop in/out control either from the optional GA-FC controller or MIDI. Two other knobs on the Artist’s front panel control cabinet resonance, with a choice of Vintage, Modern or Deep settings, and the line out ‘Air Feel’, providing close and distance mic simulations plus a blend of both. Rear panel connectors include a headphones/recording out with speaker emulation, an aux in, mono effects loop, line out and a pair of jacks for hooking up the optional GA-FC foot controller, plus an expression (volume) pedal. There’s a USB socket that provides the Katana with a desktop connection to the Tone Studio app as well as USB audio in and out. A MIDI In socket allows the Katana’s switched functions to be operated from a MIDI controller, however, there’s no MIDI Out/Thru, so the Katana can only receive patch change commands - it can’t control an external MIDI device but it can be controlled by one, which is not always ideal. Plugged in and switched on, the Katana Artist sounds come over as real, with excellent dynamic response and plenty of punch from the superb British-voiced Waza Craft loudspeaker, which combines plenty of volume with bright, slightly edgy highs, a woody midrange thump and plenty of bass from the oversized cabinet. This can be emphasised with the Deep cabinet resonance mode engaged, although our preference was for Vintage mode, which would sit in a live band mix better. The Katanas don’t play ‘what’s my line?’ with amp models, so you won’t hear facsimiles of any other well-known designs. However, much of the next generation Tube Logic technology was based on classic tweed amps from the 1950s and this is reflected in the clean and crunch sounds, which are among the most impressive low and medium gain models we’ve heard. Cleans are bright and spanky, sounding excellent with our Strat, spiced up with a touch of delay and reverb from the on-board effects. The crunch can be tamed with reverb and careful use of the extended Tone Studio parametric EQ, for excellent multi-purpose lead and rhythm tones that clean up nicely from the guitar’s volume control. the effects are impressive, and by sensibly limiting tweaking to around half a dozen parameters for each sound there’s more than enough to play with yet no danger of being bogged down. Our favourites include the new SDE-3000 delay and the built-in wah, which can be triggered from an expression pedal. Using the optional GA-FC foot controller turns the Katana into a formidable performance tool, with access to all eight patches, volume control and an assignable expression pedal. The Katana’s effects are good enough to replace many pedalboards, however stompbox diehards will also enjoy the Artist’s loop, which can be remotely switched in and out from the foot controller or MIDI. When the standard Katana 100-watt combo is almost half the price and uses the same software, why would you pay the extra for the Katana Artist? One compelling reason comes in the shape of the Artist’s Waza Craft G12W loudspeaker, which takes its inspiration from the classic British stack driver of the late 1960s. This speaker is one of the best ‘greenback’ tributes we’ve ever heard, and after a few more hours to properly loosen up the cone it’s going to sound even better. It’s a slight disappointment for us though, that this wonderful premium driver isn’t housed in a slightly more upmarket cabinet. The line out and cabinet resonance knobs are also useful, but can be accessed on other Katanas through the Version 2 software. Compared to the rest of the range, this Artist combo is relatively pricey. However, the sounds have a depth and authority that challenge top-flight modellers costing well over twice as much, not to mention quite a few valve amps. Considering it’s aimed at the pro-end of the market, it’s good value and offers a more affordable and portable alternative to the Waza Craft heads, without sacrificing too much tone and features. With sounds that challenge many good valve amps and stay consistently good night after night, not to mention effects that are as good as those on many pedal boards, the Katana Artist is a tempting proposition for creative pro players as well as the function band guys who need a range of authentic presets.